This is wrong on so many levels, I don’t know where to start. Hampshire College lowered their flag to half-staff after Donald Trump won the Presidency. That is just disrespectful in the extreme. But it gets worse. Students then burned the flag. And adding insult to injury, the university has now banned all flags. Talk about a wrong move and then a severe over-reaction. What a bunch of pansy, Leftist asshats. Veterans and community members were ticked to begin with when the school lowered the flag, but they were furious when the flag was burned. One said, “It is a disrespect. That shouldn’t have happened in the first place.” I so agree. This happened the night before Veterans Day. The students should have been punished instead of removing the flags. What kind of morons run this school? Oh, I forgot… liberals. Following the Nov. 8 election of Republican Donald Trump — and the violence that followed — Hampshire College lowered its American flag on campus to half-staff. As you might imagine, the move by the Amherst, Massachusetts, school upset veterans and some community members, WWLP-TV reported. But that was just a preview of what was to come. 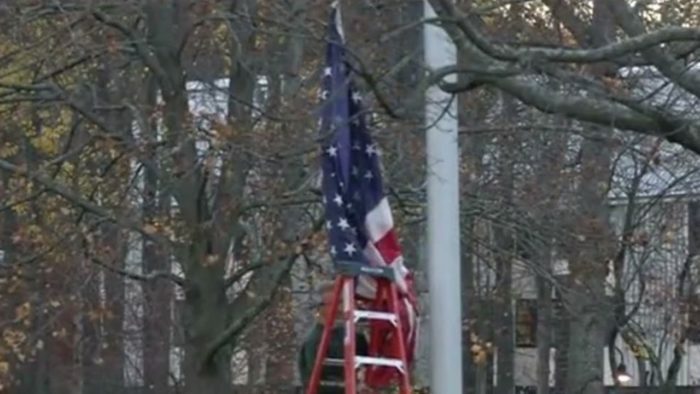 On the eve of Veterans Day, some students burned the half-staff flag, the station said. The reaction from Hampshire College? It won’t fly the U.S. flag or any other flags. Their excuses are just so much bull crap. This is massively infuriating. I sure wouldn’t be paying for my kids to attend that university. What an insult to veterans and the President-elect. It’s intolerance and discrimination and this university seems to be a Petri dish for it. The Hampshire Howler, a student newspaper, ran a piece on Nov. 14th titled: “Take Down the Flag and/or Perish as an Institution.” It noted that “now is the time” to take the American flag down and “we are the ones to do it. If we don’t, it will be hard to feel that we stand for anything.” So, it would seem that the students and faculty at this institution are communists and hate America. I’m so shocked. They’re the ones to do it alright. “As an institution, we are going to have to keep struggling to exist and to ensure that we are supporting one another in a country that we will soon find ourselves at odds with,” the piece added. “This is not only about the flag, this struggle. But the flag symbolizes it.” Here’s an idea… leave. Take you privileged behind and go. America won’t miss you and you will no longer be at odds with your fellow Americans. But before you go… put the American flag back where it belongs.